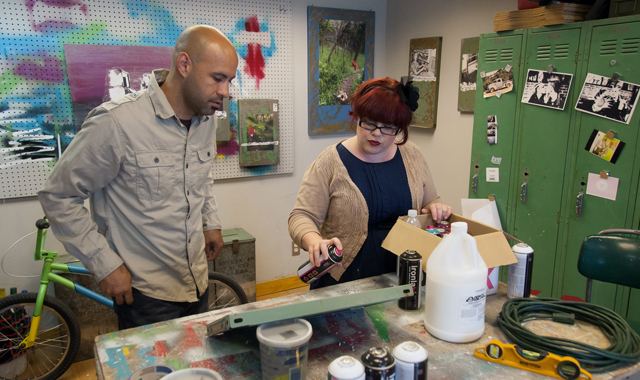 Where Salt Lake’s First South terminates beneath the sweep of the I-15 freeway Blake and Cat Palmer are busy in their studio preparing work for a number of upcoming projects. Encouraging and supporting each other, involved at times in overlapping endeavors but determined to stake out individual artistic territory, the two artists are involved in the delicate but rewarding dance that comes when a couple follows the same passion . . . In the June 2012 edition of 15 Bytes, read how artists Blake and Cat Palmer work together to achieve their individual artistic goals.